Qazi Husain Ahmed, a leading Islamist politician, and Hamid Mir, a GeoTV anchor and champion of right-wing causes, have recently been targeted by the Tehrik-e-Taliban Pakistan (TTP) assassins. Fortunately, both men escaped unhurt. The TTP spokesman Ehsanullah Ehsan has claimed responsibility for the suicide attack on Qazi Husain in FATA and for planting a bomb under Mir's car in Islamabad. In spite of TTP's claim of responsibility, JI's former chief Qazi Husain Ahmed has blamed the US for the suicide bombing attempt by a female bomber in Mohmand Agency in FATA, the Federally Administered Tribal Area of Pakistan . Pakistan's newspaper The News reported that Qazi was targeted by the TTP "because of his April 2012 interview wherein he had described the Afghan Taliban’s resistance against the US-led Coalition Forces in Afghanistan as 'true jehad' and that of the Pakistani Taliban in Pakistan as 'un-Islamic' ". Accepting responsibility for the assassination attempt on Hamid Mir, the TTP spokesman Ehsan told AFP: “Life and death is in the hands of Allah. Allah saved his life but we will make a similar attempt again". Ehsan further said that “Hamid Mir earlier shot into prominence for working in the interest of Islam and Muslims. We targeted him because now he is working against Islam and Muslims." These latest assassination attempts are a clear indication of the fact that the Taliban have now turned into Frankenstein monsters bent upon destroying the very people who have created or fostered them for decades. While Qazi Husain publicly insists on blaming the Americans, he and other Islamists must be very worried in private because these latest episodes point to a deep divide within their ranks. Both moderates and radicals among Islamists share a fairly common base of support. But a growing chasm among them has manifested itself across the Islamic world for sometime with the radical salfis challenging the more moderate and pragmatic Islamists in Egypt, Gaza, Libya, Tunisia, Pakistan and elsewhere. 1. A broad-based national campaign to educate the people about the serious threat posed by the Taliban militants and various sectarian outfits which are ripping the nation apart. Such a campaign requires broad support by the national media as well as all the political parties which believe in Pakistan's constitution, democratic institutions and political process. 2. Use national consensus to back selective use of military force in FATA and elsewhere to quell militants who refuse to lay down their weapons. RH:"...the Taliban have now turned into Frankenstein monsters bent upon destroying the very people who have created or fostered them for decades"
"The first challenge to the two-nation theory came from ethno-nationalism in East Pakistan. It is now seen increasingly in Balochistan and Sindh. A new and graver threat comes from unleashing religious passions. Attempts to make Pakistan a mamlikat-i-khudadad (theocracy) have lit uncontrollable fires of religious intolerance. Increasing sections of Pakistan’s population are resentful at being treated as second-class citizens. Earlier, Hindus, Christians and Parsis were outcasts. Ahmadis followed in 1974. It is even worse now. Today, if you are known to be Shia or Barelvi, you could be in danger in many parts of the country. The life of a Hazara Shia is no longer protected by the state; hundreds have been slaughtered by groups enjoying state protection. Pakistani Muslims now offer Friday prayers under the shadow of gun-wielding guards. Ironically, Muslims are safer in two much-reviled countries — India and the US." "It is no surprise that there is widespread despondency among Pakistan’s intelligentsia and the flight out of the country of its best doctors, engineers, scientists and other professionals. The economy perpetually teeters on the brink. One push and it may collapse"
The Islamic Republic of Pakistan is not a place where visitors expect to see billboards advertising “Liposuction, Tummy Tuck, Breast Reshaping” for middle-class women, let alone brothels to entertain middle-class men in a red-light district near the main mosque. They are both there in the sprawling commercial city of Lahore. Nor is Pakistan a country where foreigners wary of Islamic extremism would necessarily envisage a politically correct gender studies centre such as the one at Quaid-i-Azam University in the capital Islamabad – where students, male and female, discuss everything from honour killings to reproductive rights. Yet Pakistan is more diverse than outsiders tend to think and the beliefs of its 180m people are more heterogeneous than in many other nations that profess themselves Islamic. Women hold positions of power in politics, business and academia; mystical Muslims worship at Sufi shrines that are anathema to puritan Sunnis in the Saudi mould; and those who might be categorised as Islamic extremists have never won more than 12 per cent of the vote in a general election. Few Pakistanis dispute that the weakness of the economy is a source of fragility, that drastic electricity shortages stoke public anger, or that corruption is worsening further as the election approaches. A few investors, foreign and Pakistani, look back to the decade long military rule of Pervez Musharraf, which ended in 2008, as a kind of golden age of growth and prudent decision-making. But even Gen Musharraf will wear civilian clothes if – as he hopes – he is able to return from exile to join the political fray. And even business leaders appalled by the state of the economy now hesitate to recommend military intervention in modern Pakistan. This is a companion website for the book Who Killed Karkare? - The Real Face of Terrorism in India by SM Mushrif. REDIFF: Is it only right-wing groups that spread terror? Is Pakistan an angel? MUSHRIF: No. That is not what I am trying to say. Pakistan is our enemy and a threat from them is always there. They have caused enough damage in Kashmir. What happened in Mumbai is a reality. It was an attack by Pakistan-based groups and there is no denying that. What? Dr. Haq, do you accept this statement by S.M. Mushrif? Do you agree with him that our people deliberately went over to Mumbai to wantonly massacre innocent civilians in cold blood? How can our large-hearted Pakistani people be involved in something like this? Do you think S.M. Mushrif is just saying this under duress? Or do you think he is lying about our country just to make some money? What are your views? HWJ: "How can our large-hearted Pakistani people be involved in something like this? Do you think S.M. Mushrif is just saying this under duress? Or do you think he is lying about our country just to make some money? What are your views?" Pakistan has more than its share of bigots who do not hesitate to kill people they don't like. SM Mushrif, the author of "Who Killed Karkare?" and former police chief of Maharashtra state, has raised some very serious questions about the role of the Indian intelligence in the increasing violence committed by Hindutva outfits against India's minorities, and how India's Intelligence Bureau diverts attention from it by falsely accusing Indian Muslims and Pakistan's ISI, as was done in Malegaon and Samjutha Express blasts. You should Mushrif's book to understand the depth ad breadth of bigotry and violence perpetrated by the Hindutva groups. PESHAWAR, Pakistan -- Five years after setting up an umbrella organization to unite violent militant groups in the nation's tribal regions, the Pakistani Taliban is fractured, strapped for cash and losing support of local tribesmen frustrated by a protracted war that has forced thousands from their homes, analysts and residents of the area said. The temperamental chief of the group known as the Tehrik-e-Taliban Pakistan (TTP), Hakimullah Mehsud, recently offered to start peace talks with the government, raising the prospect of a negotiated end to Pakistan's war against insurgents in a lawless region that runs the length of the border with Afghanistan. The group's offer of sanctuary to Afghanistan's Taliban has been one of the most divisive issues in U.S.-Pakistan relations and has confounded efforts to get the upper hand against Afghan insurgents after more than 11 years of war. Pakistan denies providing outright military and financial help to militants fighting in Afghanistan. With 120,000 Pakistani soldiers deployed in the tribal regions, Pakistan has waged its own bloody battle against insurgents that has left more than 4,000 soldiers dead. In interviews with analysts, residents and militant experts, Mehsud's network has emerged as a narrow collection of insurgents - often with links to criminal gangs - that has only limited influence in a vast tribal region overrun by scores of insurgent groups led by commanders with disparate agendas and varying loyalties. Rather than a precursor to peace, Mehsud's offer to talk peace is an attempt to regain stature, silence critics and gain concessions from a weak government heading into nationwide elections, according to those familiar with the militant organization. Taliban spokesman Ehsanullah Ehsan has repeatedly denied reports of divisions within the TTP, including reported challenges to Mehsud's leadership. But Amir Rana, director of the Pakistan Institute of Peace Studies, said Mehsud's offer to talk was an attempt to divert attention from internal rifts that are ripping the organization apart and diminishing its influence. Meshud speaks for fighters restricted to his own tribe, based in North and South Waziristan, he said. "They are weak, there is infighting," said Mansour Mehsud, director of research at the FATA Research Center named for the Federally Administered Tribal Areas. Pakistan's tribal regions have a special status under Pakistani law that allows tribal traditions and customs to rule. Many of the laws and rules applying to the tribal area date back to the early 20th century when the British ruled the subcontinent. Unable to control the tribesmen, the British made agreements that allowed them safe passage through tribal territory. "They used to have the support of most people but not anymore," said Mehsud, who has no relation to the TTP leader although he shares the same tribal links. "People used to think that they would bring justice based on the Quran but instead fighting has displaced hundreds of thousands of people." Mehsud said the Pakistani Taliban also were running out of money and that extortion and kidnappings had become one of their biggest sources of income. A wealthy trader living on the edge of the tribal area, who was afraid to give his name because he feared retribution, said the Taliban swindled thousands of dollars from him. He said he was threatened, his family was terrorized and then a bomb exploded at his home, seriously wounding his niece. He said other businessmen told him that they too had paid large sums of money to the Taliban. In his tribal culture, he said it is shameful to admit to being robbed because it is seen as a sign of weakness, so no one has said anything. ISLAMABAD: Pakistan on Thursday expressed concern over continued presence of safe havens of Tehrik-e-Taliban Pakistan (TTP) in Kunar and Nooristan areas of Afghanistan. The spokesman said Pakistan has taken up the matter many a times with Afghanistan at all levels and hoped that these safe havens of TTP would be eliminated. He said presence of safe havens is a serious matter but Pakistan would continue to remain in cooperative mode with Afghanistan as this is best way to defeat the evil forces. The spokesman said Pakistan is following a policy of goodwill towards Afghanistan and wanted its reflection in Afghan policy as well. Referring to Afghan decision not to send military delegation for a training course in Quetta, he said training activities are meant to build trust and confidence between the two countries. "We should not miss this opportunity as it promoted bilateral relations and build trust," he added. As for the excuse presented by Afghanistan for not sending delegation for training, the spokesman said, "There was some intrusion from Afghan side and our troops only responded and that too in a disciplined and responsible manner.There was no artillery shelling as alleged by the Afghan side." but also in the whole region. Union has approached for sending election observers to Pakistan. to inform about their programmes to the Ministry of Interior. Media mogul Mir Shakil-ur-Rahman has played an outsized role in shaping Pakistan's politics in recent years. Now, his empire is struggling for survival after colliding with the country's most powerful institution: the military establishment. 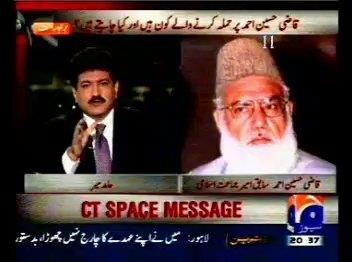 The clash was sparked by the shooting last month of Hamid Mir, the star journalist of Mr. Rahman's Geo TV channel. Geo reporters alleged on broadcasts that the military's main spy agency was behind the attack. The military angrily denied the claim, and is now pushing to shut the network. On Tuesday, Pakistan's media regulator will begin hearings on whether to close the channel. The controversy is reversing fragile gains made by increasingly assertive Pakistani media over the past decade, analysts and media professionals say. "Media has become a power center in Pakistan," said Absar Alam, an anchor at Aaj News, a competing news channel. "That has triggered alarm among traditional power players who think that they should have the exclusive right to shape opinion." Central to the drama is Dubai-based Mr. Rahman, who owns Pakistan's biggest-selling newspaper, the Urdu-language Jang, in addition to Geo, the leading TV news channel. According to employees, Mr. Rahman is intimately involved with editorial decisions at both outlets, which have pushed for the prosecution of former military ruler Pervez Musharraf, campaigned for peace with archenemy India, and highlighted the abduction of suspected militants by security forces. Geo was also instrumental in bringing to an end Mr. Musharraf's regime in 2008 with heavy coverage of an opposition movement led by lawyers that made a hero out of Supreme Court Chief Justice Iftikhar Chaudhry. The political sway of his media empire has alarmed some Pakistanis, including rival media organizations, the military and some politicians. "If one person has the power to set the political agenda, that is frightening," said Moeed Pirzada,an anchor at the competing Express News, which has echoed military criticism of Geo. "He is running a monopoly." The boldness of Mr. Rahman's media group mirrors the larger struggle between civilian and military forces for power as a country ruled by the army for half its history tries to develop democratically. Mr. Rahman's publications were critical of the previous civilian government of Pakistan Peoples Party, which barred its members from appearing on Geo for more than a year in protest. They offered friendlier coverage of Prime Minister Nawaz Sharif, elected a year ago. 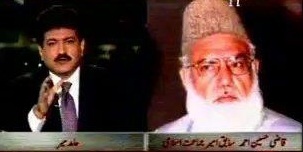 Mr. Sharif, in turn, is widely seen as supporting Mr. Rahman in his confrontation with the military. Mr. Sharif visited Mr. Mir after the assassination attempt but denied he was taking sides. The government established a judicial commission to investigate the shooting and denied any conflict of interests. "Geo was somewhat softer on this government," said Hasan Askari Rizvi, a security analyst. "There is a feeling in military circles that after the shooting, Geo reacted this way because they had some kind of government support." Some Pakistani media industry leaders say that Mr. Rahman may have miscalculated with his decision to run the accusations against the ISI in such a stark way. This overreach, they say, is allowing the military to respond by taming all coverage of its activities and to divide civilian forces. "The space for the military establishment was shrinking," said an executive at another television channel. "He has given the game back to the military."